Kolob Canyons Road starts at the Kolob Canyons Visitor Center and travels 5.3 miles to Kolob Canyons Overlook, where the unique rock formations and postcard views are on display. The Kolob Canyon Road takes less than an hour to drive, including stops for pictures. 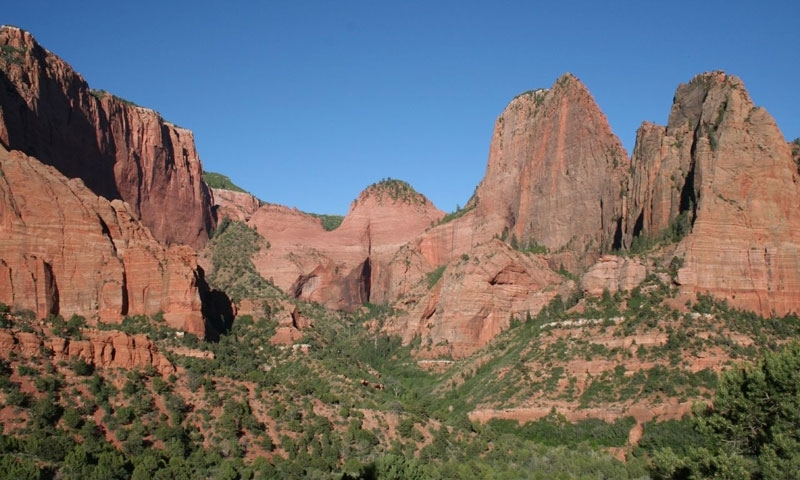 Take the chance to hike some of the short trails entering the Kolob Canyon. There are turnouts for pictures as well as explanations of interesting geological and wildlife characteristics. The total distance is 10.6 miles roundtrip. Kolob Canyon Road travels from the Kolob entrance on the northwest side of the park and crosses Hurricane Fault, which created the Markagunt Plateau. 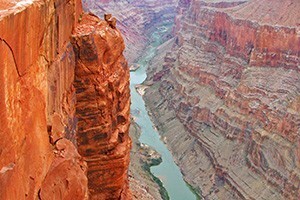 The scenic turnouts reveal incredible finger canyons that stretch out into the Navajo sandstone. Kolob Canyon Road starts at Exit 40 of I-15. The Kolob Canyon Visitor Center, at the park entrance, is about 40 miles north from St. George and 20 miles south of Cedar City. The road is a one-way trip, ending at the Kolob Canyons Overlook. The drive is short, but gains 1,100 feet in under five miles. The total distance of the drive is just 10.6 miles roundtrip, but drives longer, with the steep incline, turnouts and overlooks along the way. Located at the end of the road, this overlook treats the eyes to panoramic views that cause sound-minded people to reassess their lives, starting with a picnic at one of the many tables available. Along the way, there are numerous interpretive roadside exhibits about various aspects of Kolob Canyon, Utah. 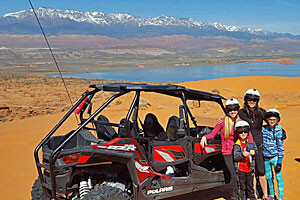 Explanations of geological movements such as the Hurricane Fault, special wildlife adaptations of the local species, and other unique features make for an interesting drive. Just a short, one-mile hike from the Kolob Canyon Overlook brings hikers to a higher viewpoint, looking over Timber Creek, Kolob Terrace and the Pine Valley Mountains. The main trail follows the Middle Fork of the Taylor Creek up a lush finger canyon. Take it the entire 3 miles up, or turn around whenever it suits the group. At 14 miles long, this is a full day's trek down to one of the world's largest freestanding arches, Kolob Arch. Dropping down Timber Creek and La Verkin Creek, this out and back passes through some beautiful terrain before revealing the final arch.